The magical journey of a Kansas farm girl comes to life, and you can join her in a unique interactive experience! Join Dorothy in a guided tour that starts at her farm, Dorothy s House, that L. Frank Baum wrote about in the classic, A home built in 1907 has been preserved and restored to reflect the Gale farmhouse from the famous movie, and Dorothy will walk you through before taking you somewhere over the rainbow when she starts her journey down the Yellow Brick Road. 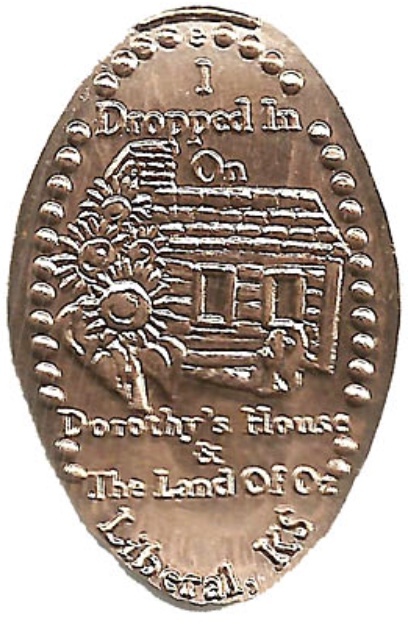 Enter the 5,000 square foot animated "Land of Oz" as Dorothy and Toto continue their adventure to see the Wizard of Oz while meeting Munchkins, a Scarecrow, Tin Man, a Cowardly Lion, and trying to avoid a Wicked Witch. She will guide you through apple trees, flying monkeys, and even show you a horse of a different color. After a face-to-face visit with the Wizard, you all return right back where you started, on Dorothy s farm in Kansas! You will see unique memorabilia, including the actual model of the home that was used in the tornado scene in the 1939 movie. Admission is required for this unique experience that can only be found at the official Gateway to the Land of Oz, Dorothy s House in Liberal, Kansas!